Baby it’s cold outside, the weather just isn’t delightful, so as long as it’s gonna snow, tune in tonight ( 12/14/10) to 95.9 in Mass. or http://www.959watd.com/ This is a much better way to pass a wintry night. Just before 8 p.m. make a cup of your favorite hot beverage. Pull on warm socks and wrap yourself and against a winter draft. Settle into a comfortable chair( OK if you tend to nod off then make it a uncomfortable chair) Tune your radio or computer to SPOKEN VOICES and listen. This writers, book and storytellers group will bring you warm words, thoughts and some of their best mental meanderings. If the wind howls about the gables it’s only jealous it can’t come in and listen. You can listen though so tune in, I’ll be there listening too. 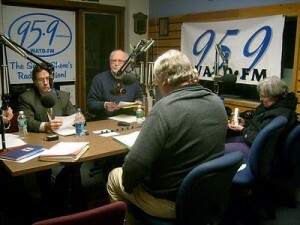 Jay O’Callahan www.ocallahan.com and his group will be on the air waves this evening. If you have heard Jay’s “Pouring the Sun” or “Forged in the Stars”, you can already guess this might be some extraordinary listening.